Do you want to know why should you use Bluehost for your business in 2019 and beyond? You’re in the right place. A hosting service can make or break your blogging success. If you choose a bad one, it can result in slow loading times and frequent site downtime that could badly affect your business. That’s why hosting your websites or blogs is one of the most important tasks. So what are things you should consider before choosing the right hosting service and how important is a hosting service for your online businesses? Let’s jump into the details. How a hosting service could affect your business? Bluehost Shared Vs VPS Vs Dedicated hosting : Which one should you use for your business? Why should you never use a free or cheap hosting service? Why use Bluehost for your WordPress sites? Loading time: Your website loading time is the most important thing that could affect your business for good or bad. If your site loads within seconds, you will have more conversion rates. If it takes too much to load, your visitors choose someone else’s site instead of yours. So keeping your loading time to optimal times is the biggest challenge for any online marketer. And your loading time depends mostly on the web hosting service you use. If you use a reliable service like Bluehost, you will be able to run a website that loads amazingly fast. Hacking: Security is becoming #1 priority to the online marketers especially in 2014. If you don’t care about making your site hack proof, your site may get hacked or cracked one day. If you host on Bluehost, you can have total backup of your site, and you can make it hard to hack your site. Database and full website backup: You need to make sure to keep full backup of your whole database and website contents on a secure server. Bluehost is the best choice when it comes to regularly taking DB backup’s. It’s a hassle free way to backup your whole contents, even a non-tech savvy can find this task easy. Whether you know it or not, Bluehost is used by over 2 millions websites worldwide. Bluehost is one of the most affordable and popular web hosting companies in the world which is a part of EIG (Endurance International Group) since 2010. If you’re wondering about why should you use Bluehost for your business and want to know about all the features offered by Bluehost, check them out. Do you want to know how the Bluehost hosting control panel looks like. Check it out. Whether you are running a small business, an eCommerce store or a BIG online portal online, Bluehost offers you all kinds of hosting solutions which are listed below. Let’s briefly talk about them so you will better understand why should you use Bluehost for your business in 2019 and beyond. Shared hosting is where several users use the same server resources and you can grab the web hosting plans for cheap prices. Bluehost is currently offering the following pricing plans in shared hosting. If you want to speed up your site loading times to a great extent, VPS hosting is right for you. Bluehost VPS hosting has following 4 pricing plans. If you want to get admin root access along with ultimate website performance, dedicated hosting is for you. It has 3 pricing packages mentioned below. Uptime is the amount of time that a server has stayed up and running. If you’re using Bluehost or any other hosting for your business, it’s important to know how their uptime is. Uptime is usually listed as a percentage, like “99.9% uptime” and it easily gives you an idea about how good a Web hosting provider is at keeping their systems up and running and Bluehost offers you 99.99% uptime guarantee. Just have a look at the below screenshot to know how great Bluehost uptime is. Bluehost performs extremely great in the Uptime Test, with an average result of 100 percent (as you can see from the above). Quick note: If you have any issues or want to know how your site’s Bluehost servers are performing, you can check all that information from here. WordPress is the world’s largest CMS (content management system) which is used by over 65% of the websites in the world including top sites like TechCrunch, The New Yorker, BBC America, Bloomberg Professional and so on. WordPress is also free to install, deploy, and upgrade and gives you access to thousands of plugins ranging from business to eCommerce to SEO. WordPress.org itself officially recommends Bluehost as a preferred hosting choice. So if the WordPress itself recommends a hosting site to its users, it’s something that you should definitely check out. If you’re going to use Bluehost for your business, should you use shared hosting or VPS hosting or dedicated hosting? Let’s first talk about the major differences between both shared hosting, VPS hosting and dedicated hosting so you’ll understand it better. Shared hosting from Bluehost: In this type of hosting a large number of users have their account on the same physical server, so you’re going to the same resources that are allocated for other users too and that’s why shared hosting is also cheap. Bluehost shared hosting plans pricing start at $2.95 per month. VPS hosting from Bluehost: VPS hosting supports huge amount of traffic and more control over your sites like a dedicated server (by giving you administrative access) but only at a fraction of the cost of dedicated hosting. Bluehost VPS hosting plans pricing start at $14.95 per month and gives you an edge of dedicated hosting at the cost of literally shared hosting plans. Dedicated hosting from Bluehost: Dedicated hosting is an advanced form of hosting where you can purchase the whole servers intended solely for their use. So if you want better speeds, security and exclusive servers that are managed only to serve your website, you should definitely go for dedicated hosting. Bluehost dedicated hosting plans pricing start at $74.99 per month and worth every penny if your business has huge amounts of traffic. So what’s the bottom line? Should you go for shared, VPS or dedicated hosting from Bluehost to run your business? We recommend you to go for VPS hosting as it comes at the cost of shared hosting but almost gives you the same advantages of dedicated hosting. Bluehost has a custom domain manager that you can use to perform tasks like domain transfers, purchases, tracking and overall administration from one place (which is your Bluehost cPanel). It also offers you unlimited email accounts (included even with all shared hosting plans), along with POP3 and IMAP support and spam protection. So you can literally create any number of email accounts to send to your customers with less to zero spamming. 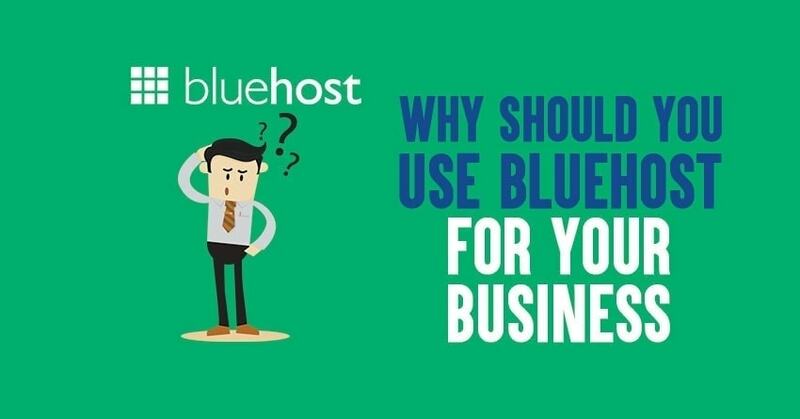 So why should you use Bluehost for your business? We hope, by now, you might already got an idea that Bluehost is definitely a great choice for your business. But if you’re still thinking about it, you should probably know the pros and cons of using Bluehost for your business. There are actually no monthly hosting plans offered by Bluehost. While you’re running an online business, it’s not a big deal but for starters with limited budget, monthly hosting plans definitely offer some help (although monthly plans are usually expensive). You get $2.95 per month hosting offers from Bluehost only with 3 year plans. If you want to get 1 year plan, the pricing is bit higher. Most people especially the beginners to online world use either cheap or free hosting services for their websites and blogs. This is the #1 mistake anyone could make. You should never use a free or cheap hosting service if you want to build a profitable online business. Why? There are many reasons. These cheap services usually give you low bandwidth thus results in site downtime almost every time you get huge traffic. It’s easy to crack into your free hosting service provided sites (they don’t follow much security precautions). Why install Bluehost on your WordPress blogs instead of others? It’s the #1 hosting service that is used by over 2 million websites and recommended by WordPress itself! I’m myself using Bluehost on some of my website from the beginning and never encountered any problem related to site loading or downtime. I strongly recommend Bluehost for anyone who wants to set a successful platform online. Here are few more reasons to consider installing Bluehost on your websites. Make sure to read them all before you buy. Don’t Miss: Bluehost Coupon for maximum saving. Do you want to get a free domain name for an year? Bluehost is the choice. There’s no reason for you to spend additional dollars on registering your domain name when you’re getting it for free at Bluehost. When you signup with Bluehost, you will get a chance of registering a free domain name with them. You just have to buy their hosting service for at least one year. When it comes to choosing a reliable web host for your online business, you should first check out their support or customer service. If they are top notch, you can go ahead without thinking twice. When you are faced with any site related problem, contact Bluehost’s support team. They are available 24X7. You can make a call, email or perform a live chat to discuss about your problems. Their support team is cordial and will help you solve your problems in minutes. I personally have encountered a problem once, and they solved in few minutes and this is the same response from the users of Bluehost all over the world. You can get a 3-year hosting service for as little as $2.95 a month, that is dead cheap you’re paying for a top class web hosting service. There are 3 different (affordable) packages in Bluehost. See the above price chart, as you can see, if you choose 3 years package, you’ll get to pay just $2.95 per month (along with a free domain name). There are more than 20,000 webmasters who are creating their websites and blogs on Bluehost each and every single month! It indirectly means how trusted their services are. And more than 2 million bloggers are using Bluehost worldwide, it says it all. Bluehost is built for speed and they have top class servers to host your websites. You will never see a downtime if you are running your sites on Bluehost hosting service. You can save unlimited databases and consume as much bandwidth as you want. Bluehost never limits your bandwidth and you will never encounter a slow loading website. You can run unlimited number of websites on a single account which is a big advantage of using Bluehost as your web hosting service. Here are few important FAQs you must know if you want to know why should you use Bluehost for business in 2019 and beyond. 1. How much is Bluehost per month? Bluehost web hosting plans start at $2.95 per month (only when you use this exclusive link from Bloggers Passion) and you get access to their shared hosting. Besides shared hosting, Bluehost also offers you other options such as VPS hosting, dedicated hosting, cloud hosting etc and their pricing plans are different on the type of plans you choose. 2. Is Bluehost good for ecommerce? Yes, definitely Bluehost is the right choice for your business. Whether you want to launch an eCommerce website or an online store or a large eCommerce portal to sell stuff online, Bluehost gives you a wide range of hosting plans that start at $2.95 per month. Bluehost offers you excellent hosting features such as free domain name for 1 year, free SSL certificates to make your eCommerce sites more secure, backups, excellent customer support and so on. 3. Can you cancel Bluehost at any time? Bluehost offers you a 30 day money back guarantee which means, it allows you to cancel your account at any time for a 100% refund If you cancel within 30 days. That being said, If if you cancel your Bluehost hosting account within 30 days and your plan includes a free domain, Bluehost will deduct a non-refundable domain fee of $15.99 from your refund. 4. How to install WordPress on Bluehost? Install WordPress on Bluehost is really easy and simple because Bluehost gives you access to 1-click WordPress installation where you can install WordPress literally within 5 minutes. We’ve written a step by step tutorial on how to install WordPress on Bluehost along with the screenshots. So make sure to check it out after signing up for Bluehost to launch your WordPress site on Bluehost within a few minutes. 5. Which Bluehost plan is best for WordPress users? Which is the best Bluehost plan is one of the most common questions and we’ll try to give you an honest answer here. Bluehost although offers you a wide range of hosting plans including cloud hosting, VPS hosting we recommend you to give a try to either shared hosting or WordPress optimized hosting from Bluehost. Because both of them offer you incredible features at affordable prices. We certainly feel Bluehost is best and cheapest at $2.95 per month for your business and if you still are in doubt, you can also compare any hosting provider with Bluehost by comparing its features and conclude who is best. Which Bluehost hosting plan is best for you in 2019? How to start a blog on Bluehost in 2019? WPengine vs Bluehost: which host to pick in 2019? If you want to build a long lasting profitable online business, choosing the right hosting service for your business is vital. And there’s no other hosting service comes closer to Bluehost, we guarantee. It’s price is affordable, their customer support is top notch and their services are reliable – what else could you ask more for from a web hosting service? If you want to go for Bluehost, don’t think twice, you will love their services. Which Bluehost Hosting Plan Is Best In 2019: Basic, Plus Or Choice Plus? In turn, traffic to the blog can increase traffic to the regular site as well. on it will have a very structured “bloggy” feel. okay, but why you are hosted on hostgator and domain from godaddy? When BloggersPassion blog was started, it was booked from an Indian company. Later I moved it to Godaddy. I was not much happy with the Indian domain providing company. When I thought of moving it to a new domain name provider, I find it easy to move it to Godaddy. Another reason could be for many years I has the habit of buying domain name from Godaddy and then hosting my domains on Hostgator and Bluehost. At that time, I may even thought of a better choice which would have been keeping my domain name and hosting with Hostgator. Now Its going for many years and if everything keeps going well, I would keep on using Godaddy for my domain name. Update: Recently I moved Bloggerspassion.com from Hostgator to WPX hosting. We have shared our experience from Hostgator to Bluehost here https://bloggerspassion.com/unbiased-wpx-hosting-review/. I have personally used 3 web hosts till now namely Inmotion, Bluehost, and dreamhost. The one with best performance is without a doubt, dreamhost but it is not affordable for begineers. Bluehost and Inmotion is good. Inmotion has extremely good customer service…. I think bluehost and hostgator are the two leading hosting companies.And both are nearly same.But you have mentioned some really good ppoints aout bluehost here anil sir. Yes bluehost is my favorite and the best part I love about them is that they provide you with free domain name with your hosting and being a hosting company recommended by WordPress itself, there is no doubt in its reliability. As WordPress is so prone to hacking, it is must that our host maintain our dayabase backup. If you ask me to choose between hostagator and bluehost, I would recommend you to use bluehost. According to me currently, there are 3 top web hosting in the world i.e. :- dreamhost, hostgator and bluehost. I have searched a lot on the web, discussing with my blogger friends and some other sources, i have also found that bluehost is best as compared to dreamhost and hostgator. For chosing a web host, a blogger should look in the order, blurhost>dreamhost>hostgator. But, don’t you think the Hostgator is also a good hosting company? No doubt Hostgator is also a great web hosting website. But in the recent time, Bluehost has improved a lot and they looks to be much better than Hostgator or any other web hosting company for small to middle size business websites.